After months of procrastinating, I finally got around to dining at Gus's World Famous Fried Chicken. I figured that if I'm always comparing Gus's to other places, I should at least give a reason why. Gus's is the gold standard for fried chicken in Memphis, and there aren't many places that can dispute it. There are several restaurants that come close but in the end, Gus's is still tops. Unfortunately, when a restaurant is deemed to be the "best," many people flock to it, including tourists. Gus's is no exception, for there is always a line of people waiting to get inside. Seeing this would usually discourage me from going, but my love of fried chicken brought me around to Gus's. The day that I went to Gus's was on a Saturday afternoon during a Memorial Day weekend. As expected, there was a large crowd waiting to dine in. After waiting a few minutes, I got to the hostess so I could put my name on the waiting list. When I was told that it would be forty-five minutes before I could get a table, I wasn't surprised at that. However, when I dine alone, I rarely wait the full time because most restaurants can squeeze out a small table for me. This wasn't the case with Gus's, for I had to wait the full time plus thirty minutes. That is a lot of time to wait for fried chicken, but I didn't mind. When I eventually got a table, I didn't waste time in placing my order. I chose the three-piece dark combo with seasoned fries (replacing the baked beans that cost an extra fifty cents) and coleslaw. I also added a jalapeño to the order, inspired by diners that I saw earlier. It took about fifteen minutes (or about two hours after arriving at Gus's) for my order to arrive. Everything looked great and tasted even better. The chicken was crunchy and lightly breaded with a good amount of spicy seasoning. Its peppery flavor strongly appealed to the senses without overwhelming them. It also didn't have a lot of grease, just enough to make the chicken tender and juicy. In all, Gus's fried chicken was cooked perfectly. As for the sides, they didn't impress as much as the fried chicken. The seasoned fries were crunchy and lightly coated with what I believe was dry rub seasoning. The fries were mildly spicy and okay in terms of taste. The coleslaw was a bit sweet, tasting about the same as KFC's. The jalapeños (plural because I was given a freebie for waiting so long), added some unneeded pizzazz to the fried chicken (Louisiana Hot Sauce did so as well). It turned out that I didn't need it, for the chicken was perfect. Overall, I'll give the sides a "C" because they were average, not exceptional. UPDATE: May 22, 2013 - Since writing this, my opinion of the coleslaw has slightly changed. While it is sweet, the coleslaw is a nice balance to Gus's spicy chicken. I'm not sure how well it complements other foods (including Four Way's delicious fried chicken) but it seemingly belongs at Gus's. After finishing my meal at Gus's, I came to the following conclusions. While the fried chicken was great, I'm not sure I would want to go through that ordeal again given that other options are available. I could opt to hang out on Beale Street and eat at Miss Polly's Soul City Cafe. If I want to have fried chicken and take in some Civil Rights nostalgia, I can go The Four Way, Dr. Martin Luther King's favorite Memphis dining spot. Both places serve great fried chicken in an atmosphere comparable to Gus's without the long wait times. Gus's, while extremely popular, is a victim of its own success. The restaurant is far too small to small to handle the volume and should expand. If possible, it should acquire the vacant lot next to it and double its size. This could be a risk, but I think it's worth it. I'm sure the customers will appreciate it. Also, because Gus's has other locations in Memphis, the restaurant should encourage customers to patronize them, if for no other reason than to alleviate crowding. 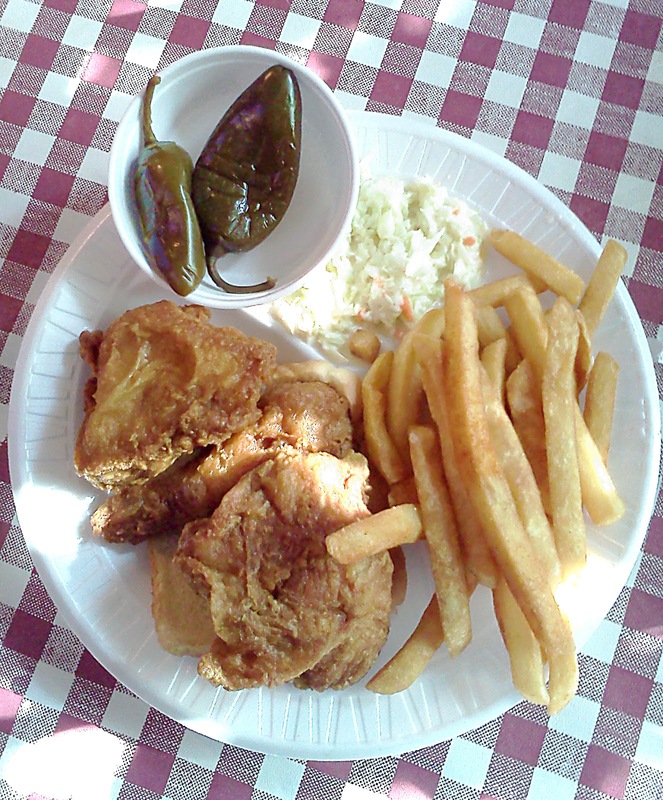 SIDE NOTE: For those really yearning spicy chicken, the best alternative in Memphis is Uncle Lou's. The wait times aren't as bad (about twenty minutes during a "rush") and the chicken is very comparable to Gus's. Despite the long wait time, I had a great experience at Gus's. The lady who served my meal was great, for she did an outstanding job in spite of the rush. 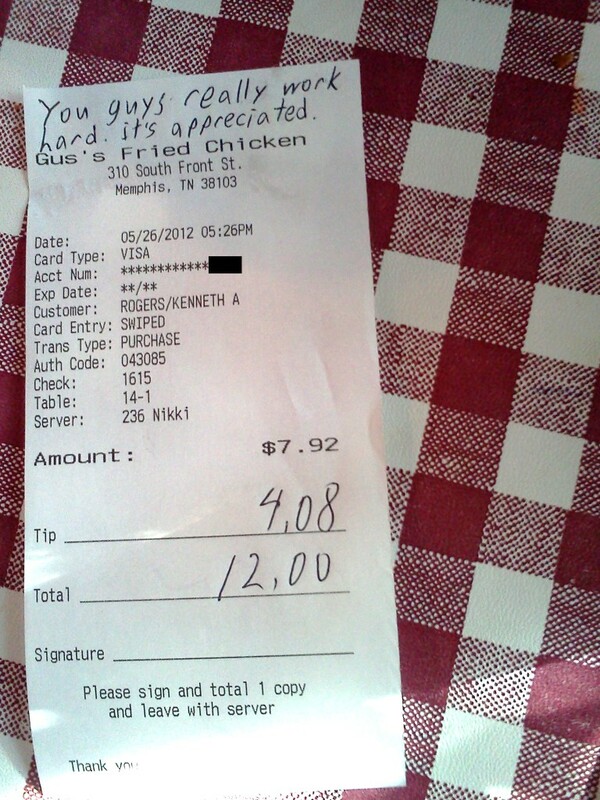 With my meal costing nearly eight dollars, I kicked in a $4 tip to show my appreciation. I'm looking forward to eating at Gus's again, as long as can avoid the crowds.